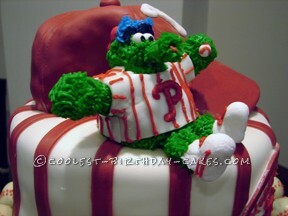 My daughter and I teamed up to make a birthday cake for a die hard Phillies fan. The guidelines were that it had to feed 70 people normal slices of cake… not skimpy wedding slices. It was for a birthday party and people wanted to eat birthday cake in normal amounts and some in un-normal amounts. It also had to scream Phillies. So we basically settled on a design that was practically a Phillies wedding cake. 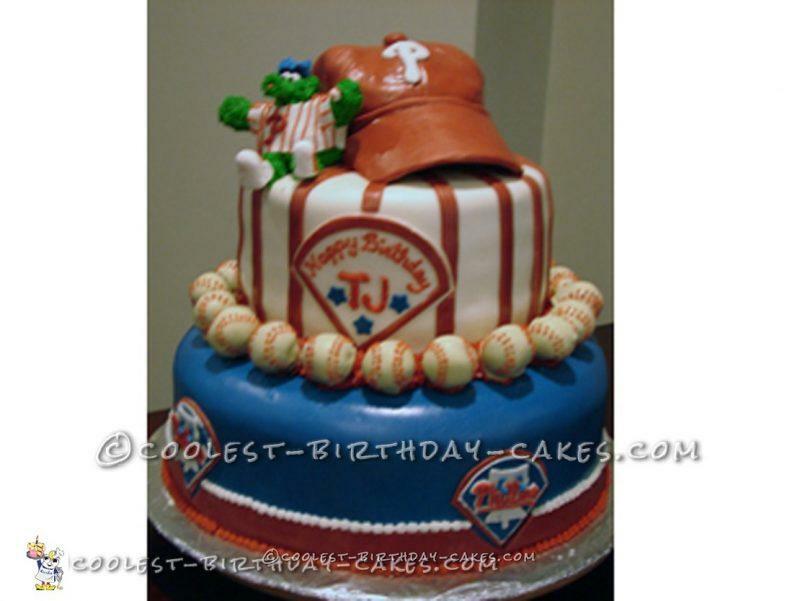 The base featured four Phillies logos, which were painstakingly hand cut and then piped. The second tier followed up with some red on white pin striping and of course a birthday message shaped to look like the Phil’s logo. Between these layers sat a ring of cake balls. While cake balls are delicious and fun, the piping of the stripes on these cake baseballs was an awful process. It was compounded by icing was too thick, and instead of fixing it, we soldiered through. Poor decision but they still came out super cute and added a lot to the cake. 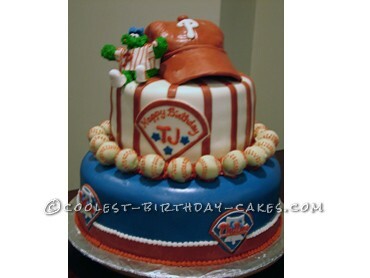 Finally we topped the whole thing off with the top cake in the shape of a baseball cap. We just freehand sculpted the cake hat by looking at an actual, slightly smushed, ball cap. And clearly, since we hadn’t gotten across the message that this guy likes the Phillies, we added a Philly Phanatic to the mix. He is gum paste and icing with a fondant shirt. If you don’t know what a Philly Phanatic is, look up this weirdo, because we’re pretty proud of our little replica. This was one of our favorite cakes and a huge undertaking at the time. We certainly learned a lot. Five minutes of fixing icing is definitely worth your hand. 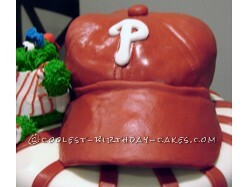 In the end, we blew the socks off our “Phillies Phan” and his guests. Definitely a home run… LOL.